Are you thinking about buying Mayan Riviera real estate? 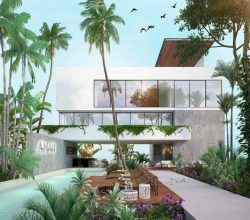 Here is an article from Lynda Kerney who bought a condo in the TAO Mexico – a Mayan Riviera property development. 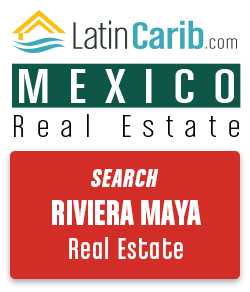 The Mayan Riviera property market includes real estate in Playa del Carmen, Akumal, and Tulum. 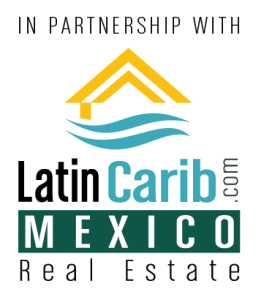 “There is an up-and-coming residential community along the Mayan Riviera, about 70 km south of Cancun, behind the gates of the Bahia Principe real estate resort. I had been thinking about buying Mayan Riviera real estate for quite a while. It was now decision time…. It was just about dusk when I drove through the entry gate to the TAO Mexico real estate community. The monolithic structure marking the Bahia Principe real estate development along Carretera Federal Cancun-Tulum (otherwise known as Highway 370) was imposing. As the sun set, the giant rock wall cast a shadow and stood in astounding contrast to the surrounding jungle. It was impossible to know what was beyond the wall until you were cleared for entry by the efficient and pleasant guards … and then, what a contrast indeed. 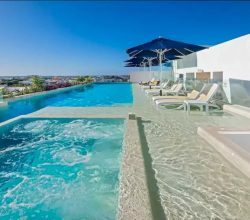 Having stayed several times in resorts or condos in the Mayan Riviera, I was eager to return once again and booked an affordable two bedroom condo at the TAO real estate development. The photos looked lovely, but I came with no expectations and just a little hesitation, as planned developments are not usually my cup of tea. I was very pleasantly surprised. The morning dawned and the lush foliage filtered the strong sunlight to the first floor TAO condo. The little patio was pleasant for morning coffee and the area around the building was quiet and peaceful. I ventured out on foot past the front gate (this is a gated community within a gated community) and located the Wellness Center and gym in just a few minutes’ walk. The area features a snack bar with decent little breakfast and lunch menu, a gift shop, and classroom. 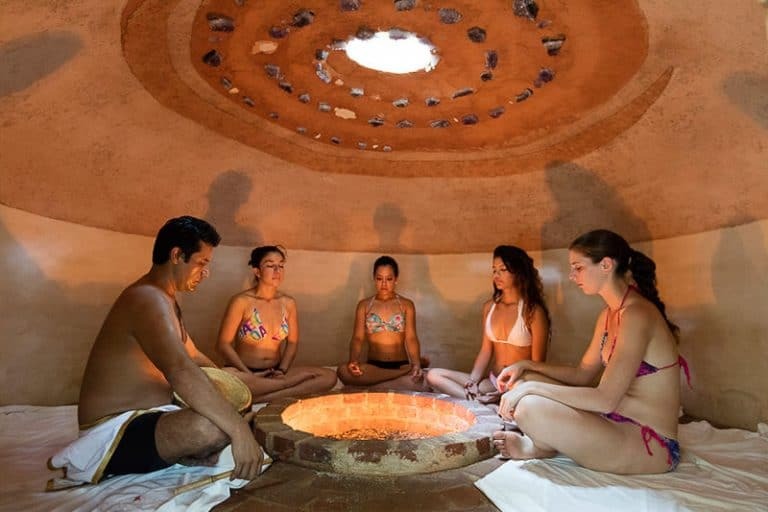 There are also a lap pool with sunning area, locker rooms, and a “sweat lodge” structure. Throughout the area, wellness messages were displayed which added to the vibe of peace and promoted a holistic and healthy culture. The TAO condo buildings are surrounded by a beautiful, tropically landscaped golf course with a surprising cenote. I’m not a golfer, but this amenity added to the serenity and upscale (yet down-to-earth) feeling of the area. I borrowed a book from the book exchange shelf just outside the gift shop and noticed a bulletin board full of great information. This was obviously a vibrant, active and engaging community! 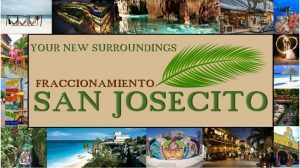 From Spanish lessons and yoga classes, to planned events featuring interesting speakers and group outings to local sights such as Mayan ruins, this place has a lot going on. Upon return to my condo rental, I met the neighbors across the open-air hall. They were a retired couple from the U.S. who live half the year at TAO Mexico. They chose the TAO real estate development not only for its lifestyle, but also for its quality construction, top-notch maintenance and access to amenities. “What amenities?” I asked. Had I thoroughly read the welcome booklet in my condo rental unit, I would have realized that I could go to the clubhouse and obtain a bracelet which would allow access to the resorts within the Bahia Principe area (behind the monolith). There are eight-passenger golf cart shuttles that run around the entire complex regularly to transport residents and guests to the various on-site hotels, beach and clubhouse. With the bracelet, I could hop on the shuttle and get around the area without the hassle of moving my rental car. Buying Mayan Riviera Real Estate for Retirement? Maybe? Maybe Not…. I had looked at property at one of the Del Webb Sun City developments in the U.S. and had been impressed with the organized activities, entertainment options and various special interest clubs. TAO offers the same type of lifestyle for active adults – on a much smaller budget. At the same time, this is not necessarily a retirement community. I encountered other residents who work in the Playa del Carmen or Tulum area, or who telecommute to jobs in the U.S. and Canada, ages 30-something to 70-plus. The TAO Beach Club area is compact but well-appointed. 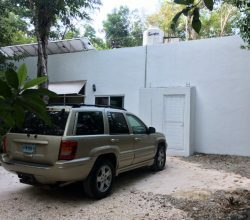 The beachfront lot has a beautiful Caribbean view, some unspoiled foliage to protect its privacy from surrounding Akumal homes, a sparkling pool, and a nice clubhouse with restaurant and second floor sun deck. At the time of my visit, the beach was sparsely populated – just three sunbathers enjoying the padded chaise lounges and sun umbrellas, with fresh drinks in their hands and their toes in the sand. The restaurant has begun serving food (expected and it has become a more popular place – even a hangout. It has that kind of atmosphere. The white mesh bar stools looked very cool and inviting and the view from the patio out to the crystal blue waves is stunning. Climbing the stairs to the sun deck, the view gets even better. The plan is to open the space for events, private or Tao-connected. It was easy to envision the patio draped with festive lights, a little low background music playing, and guests either engaged in conversation or mesmerized by the sound and view of the lapping waves just a few feet away. The TAO Beach Club is a valuable amenity just opened to the TAO Mexico real estate development, and promises to be a very successful addition. Lynda Kerney purchased her TAO Mexicocondo in June of 2017. We thought you would enjoy her decision about buying Mayan Riviera real estate. Read more about the TAO real estate in Akumal development. 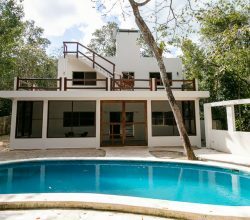 Please see more about our Mayan Riviera Real Estate Tour. Or contact us below. If you are interested in purchasing or investing in TAO Mexico – or buying Mayan Riviera real estate – please contact our Mayan Riviera real estate agent – Alex Martinez below. 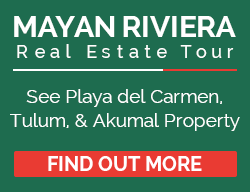 We are Mayan Riviera real estate specialists. Please contact us below for more information on real estate in TAO Mexico or other Mexico property markets.